Half Past Six, not just a time, but the name of the jazz band set to perform this Saturday at Irregardless. 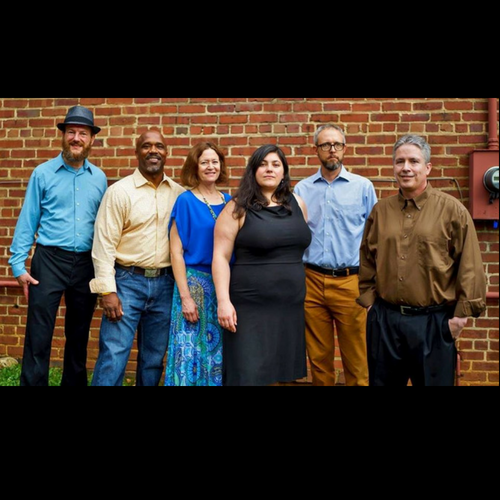 The members consist of Tara Nixon as the vocalist, Cara Albora Shaw on piano, Ken Bowers on jazz guitar, Scott Griffin as drummer, Doug Mayes on saxophone, and Chris Mervin on bass. 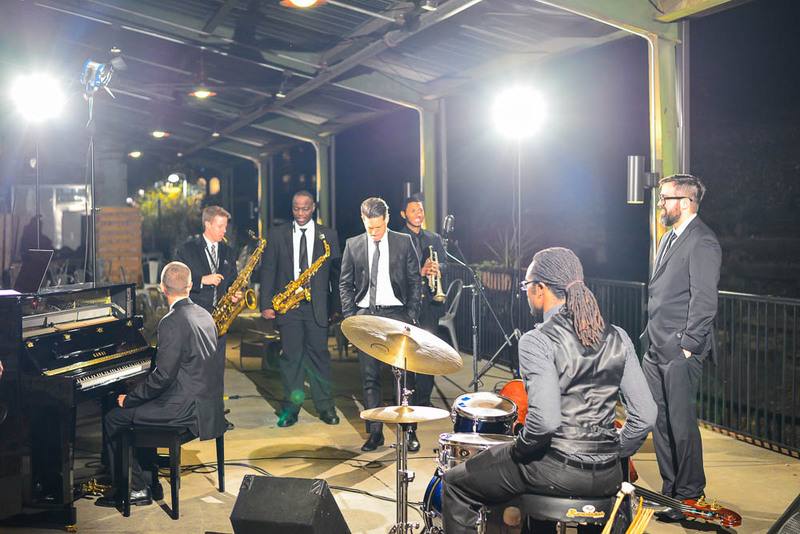 I chatted briefly with Scott Griffin about the band and their take on the jazz scene in Raleigh. When did you all form? Since about five years ago. Why did you form as a band? The bass player, Chris Mervin and I were in a big band and we were wanting to form a smaller group with the same standard, a quintet, and so we started adding numbers to get to where we could play music like a quartet or a quintet would play. Do you have a special reason why you choose the band’s group name, other than there are six members? It’s funny. We had some friends who suggested names and we put it for a vote and that’s the one that won. It did reflect that there are six members in the group, that’s part of it. One of the venues we used to play, we always met there around 6:30 and that’s kind of where it came from, anyway. It’s funny how it worked out that way. What kind of jazz music would you say you play? We focus on jazz standards, including latin. Jazz mostly from the 40s, 50s, and 60s; most of the songs are from that era. We perform about, depending on the month, four times a month on average. Sometimes more, sometimes less. How often do you all practice? Does that mean that four times a month, you also perform every week too? Right. That’s in addition to performing. How do you compare the jazz scene in Raleigh and Durham to say, NYC or Boston? I haven’t been to New York or Chicago or anywhere like that in a while, but I think that to me, anyway, it seems like the local jazz scene is growing in Raleigh. I’ve met several different other people and lots of several other bands and the quality of music has gotten better while the quantity has gotten to be a richer as far as areas in the state. I think the Triangle is a rich area for jazz. Do you think because it’s gotten, because there are more groups, more competitive? I haven’t ever looked at it that way and in a sense, I guess that’s true. We’re all vying after the same jobs, but I haven’t ever personally looked at it that way. It just seems like there’s always going to be more venues, for sure. There seems to be opportunities for everybody. I guess I’ve just never looked at it like a competitive situation. What is one fond memory you have? Performing in a certain place or certain time? Does it need to be a performance? Well, one thing I can tell you that comes to mind. We were having auditions for our singer. We had auditioned through the people and Tara came through. We all just looked at each other and smiled and just knew she was the one. That was a fond memory of mine and she’s been such a great fit. I spoke with Chris and his fond memory is similar to mine. 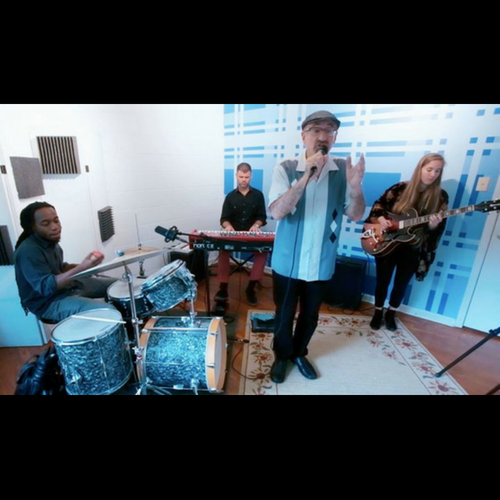 He said one of his fondest memories was when we auditioned Doug, the sax player and that we all knew he was a perfect fit as soon as we played the first song. Despite whatever weather we’re having in Raleigh, rain or shine, Soggy Po’ Boys are sure to hit it off at Irregardless this Saturday. On tour promoting their ‘Smoke’ album, which is the first full-length recording as a septet and the tracks, they claim, are as punny as their album name. 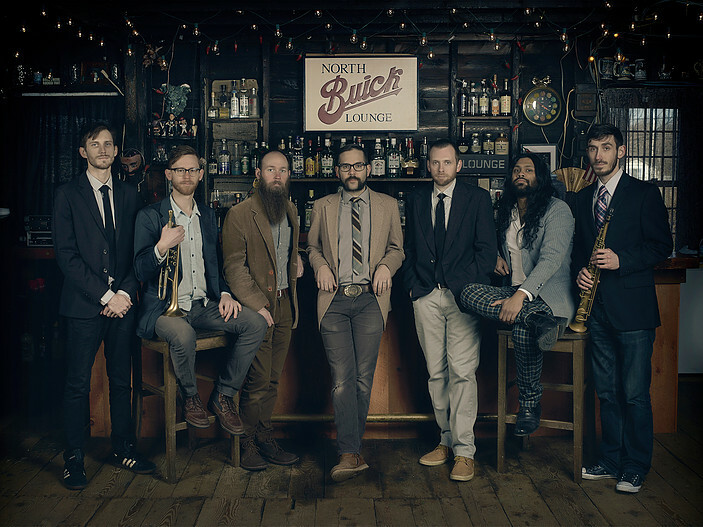 The members are Eric Klaxton on Soprano Saxophone and Clarinet, Zach Lange on Trumpet, Nick Mainella on Tenor Saxophone, Mike Effenberger on Piano, Stu Dias on Guitar and Vocals, Brett Gallo on Drums, and Nick Phaneuf on Bass. The seven member band started in 2012 in the town of Dover, New Hampshire. At the time they formed, another group just had a gig at the Barley Pub and at the end of the night, the members who would eventually be the Soggy Po’ Boys played around by the piano and decided they should play together continuously. Their music is an edgy take of the New Orleans style jazz and their songs mirrors that fact. For those who may not have heard them perform frequently in their familiar haunt of Sonny’s Tavern in Dover, this performance is sure to replicate the atmosphere and also make audiences feel as if they’ve been transported to New Orleans themselves. Playing music that inspire others is a delight and the Soggy Po’ Boys enjoy revving up the energy of the audience they play in, wherever they are. Because jazz is universal, no matter where the band goes, they’ll always find an audience. “Smoke” offers fast tracks such as So Simple or Birdseye that carry an upbeat feel while slower tunes like Meet me at the Funeral and I Hardly Knew Her carry a sweet slow-dance feel, and still hold the New Orleans vibe. And as they’re on tour now, I asked Eric Klaxton some last minute questions about the band and their new album “Smoke”. Have you all performed along the east coast before? How does it compare to performing in New Hampshire? Yes, this will be our 5th east coast tour. When we leave New Hampshire, audiences seem to respond to the fact that we aren’t/won’t be in their area often. There’s a wonderful sense of excitement and appreciation at nearly every show. What kind of themes represent the songs in “Smoke”? Smoke explores a few themes: The passage of time, love, and loss, to name a few. There is a refreshing sense of humor that hopefully doesn’t get lost in the mix as well. What track is your favorite? A favorite?!? That’s hard… Without necessarily picking one tune, I would say that my favorite parts of the record are almost entirely the group improvisations. We were able to capture some really exciting moments in the studio. Group improvisation is an important part of this music and I’m very pleased with how we played together. This is the fourth album you’ve all put out. How do you think you’ve progressed as a band in your music over the years? Well, over the years, I think we’ve spent a lot more time digging into the vast catalogue of music that’s come from New Orleans. And we all individually make a real effort to visit the city often, which definitely informs our approach to the music. Our life experiences are more vast and our perspective is broader each time around. We have also been able to better distill what we like and what we are good at. Smoke showcases that. Do you all have the same buzz feeling from releasing a 4th album as you did when you released the 1st? It’s always exciting releasing new music. I love to perform in a live setting but it’s a different kind of excitement to have made a performance permanent for everyone to hear over and over again. I will say I’m most proud of this most recent record. What excites you about performing in different places? Are the atmospheres the same? I love sharing this music with new people. It’s not a particularly common sound and it’s fun to watch people realize how much they like it. The more new audiences we can play for, the more exciting it gets. I’ve read that you bring audience members on stage sometimes when you perform in Dover. Does that still apply when you perform elsewhere? I can believe that we have done something like that in the past, but it’s not a regular thing. Maybe it should be though! Catch the Soggy Po’ Boys when they come to Irregardless this Saturday! Big bands and pop tunes collide when this band comes to Irregardless. Practically the only time they’ll play for the public, but otherwise, they play exclusively for private events. The Boulevard Ensemble is sure to dazzle when they come on the stage this Saturday. The founding members are vocalist Geoffrey Register, Tom Rau on double bass, and Noah Sager on piano. And while he’s not a founding member, Theous Jones plays drums every gig. The founders had realized they were hearing the same tunes being played at weddings and other events, either with jazz, rock or pop and decided to change that by playing and arranging a mix of songs tailored to their clients and the venue they’re playing at. Their repertoire prove their expanse of music knows no bounds, as this is only a small list of what they offer. From Frank Sinatra to Led Zeppelin, the Beatles to Britney Spears, their range travels beyond genres and the diversity in the music selection shows they have no limitation. Even the additional players they have for each gig changes where they’ll have either one horn player or four horns for an eight-piece line-up. Some musicians who have played with them include Al Strong on trumpet, Lucian Cobb on trombone, or Kim Smith on saxophone. The band can get pretty big if there’s eight people playing and Sager says it comes down to the music charts and as long as the charts are written well, sometimes, they may only need to practice one time. Maybe not even rehearse at all before a gig. And they make it work, but a gig isn’t without its faults and while nobody’s perfect, the band isn’t afraid to admit that they make mistakes. Michael Berliner and the Doug Largent Quartet will be playing at Irregardless this Saturday. This is a two-part interview as I sat down with Michael to see why he loves music and singing jazz. Then Michael sat down with Doug Largent and did an interview about him and his music. Q: Do you play any instruments besides vocalizing? A: I play some other instruments, but not to any degree of expertise. Singing has just become my thing. Q: I read that you’ve been in bigger cities before you moved to Raleigh. How does the music scene compare between those cities and Raleigh? A: Oh wow. It’s funny because when I lived in New York and then L.A., I didn’t get out to music clubs that much, mostly because it was super expensive. What I really have enjoyed here, aside from the vibrant music scene which there’s no lack of, is that it’s very accessible. I get out all the time so it’s good. It’s great. No complaints there. Q: Why did you concentrate later on in jazz and R&B? A: I’ve always loved really good jazz singers like Frank Sinatra. When I was growing up in college and beyond, I listened to Sinatra, Tony Bennett, Al Jarreau, Ella Fitzgerald, just these greats who were at this high level of awesome. And I love the sound of it, the swing of it, the feeling of it. I think for a number of years, I didn’t necessarily sing it myself; I would just enjoy it as a listener. I had sung in choruses and other kinds of venues but about half a dozen years ago, I started picking up piano again. I had taken jazz piano lessons with the idea of becoming good enough or just dangerous enough to accompany myself as a singer. I played for a while that way and I learned a lot and discovered along the way that it’s hard to play piano really well and sing. So I decided to concentrate on the singing because it’s really what I wanted to do. I started singing with a really great piano player and teacher named Alison Weiner. We would be in her studio and she’d accompany me to help me get my chops together to go out and play out. Q: So I’d say you have a pretty extensive background in music. A: I’d say so, yeah. I grew up with music lessons when I was a kid, kind of standard stuff. Piano and saxophone and singing in choirs through high school. Actually I sang choirs in college, now that I think of it. I got away from it as a performer and more of an enjoy-er. When I lived to New York, I was a commercial worker as a voice-over actor and got into that for a good while. Music has really been, throughout my life, a joy of mine and now a passion for the past couple of years. It’s easier to get into it if you take it seriously and want to do well with it and get out and play. There are opportunities and I’ve met a lot of musicians like Doug Largent. It’s been great meeting up with him because he loves that sound from the late 50’s, early 60’s era of music and I do too, so it’s been a good collaboration. He’s super generous as a musician and I really enjoy playing with him. Q: How long have you been with Doug Largent’s group? A: I’ve been singing with Doug about two years. Q: You said earlier you weren’t as experienced as him; did you mean performing? A: Yeah, when you were asking that, that’s what I meant. If you think about someone like Doug, he’s made a fair amount of his living from music for around 20 years. But that hasn’t been the case for me. For me it’s more of an avocation than a vocation. I feel honored to sing while he’s playing. Maybe I’m a little shyer with my talents than I ought to be because I’ve studied music my whole life and I love it. I think it’s sort of the focus now. Having a focus in jazz and occasionally a little bit of R&B, a little bit of pop. For jazz, it’s a training that I focus on and I think that has really paid off because when you have that sort of focus, you can go as far as you want. It’s just putting feeling into music and that’s what I love about it. To read about Doug Largent, check out this blog post from Michael Berliner.